What if all the best Tour stages happened in one race? 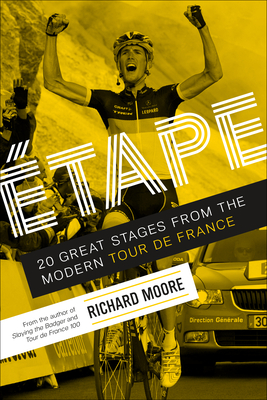 In Etape, critically acclaimed author Richard Moore weaves first-person interviews with cycling's great riders to assemble a dream team of the best Tour de France stages in modern history. Featuring exclusive interviews with the Tour's legends and scoundrels about their best-ever day on the bike (and their most heartbreaking defeats), Moore unravels lingering mysteries and recounts strange tales from 20 great stages of the Tour: LeMond's impossible return from near-death, Schleck's primal scream atop the Galibier, Merckx's self-described toughest Tour, Cav's mind-bending victory in Aubenas, Hinault's hellish battle with Fignon. Etape assembles the greatest days of modern Tour history into a Tour de France of incredible victory, glorious failure, shocking revelation, and beautiful memories. In the words of those who were there, Etape recreates each day vividly and reveals the beauty and the madness of cycling's greatest race. Richard Moore is a sports journalist and author. His first book, In Search of Robert Millar, won Best Biography at the 2008 British Sports Book Award. His second book, Heroes, Villains and Velodromes, was long-listed for the William Hill Sports Book of the Year. He writes on cycling and sport and is a regular contributor to the Guardian, Sky Sports, and the Scotsman. He is also a former racing cyclist who represented Scotland at the 1998 Commonwealth Games.